Custom Doc McStuffins gifts and apparel your little girl will love. This page features a nice selection of unique Doc McStuffins gifts and apparel such as bedding and room decor, comforter sets, hair bows, boutique apparel, Christmas ornaments, tote bags, wall decor, school supplies, beaded necklaces & bracelets, personalized shirts, stickers, tote bags and more. Many of the items listed on this page are handmade for that special touch. These gifts would make a wonderful birthday or Holiday gift for your little girl. Hosting a Doc McStuffins birthday party? Please visit my Doc McStuffins party supplies page for partyware, personalized invitations, custom party favors, decorations and cake & cupcake supplies. 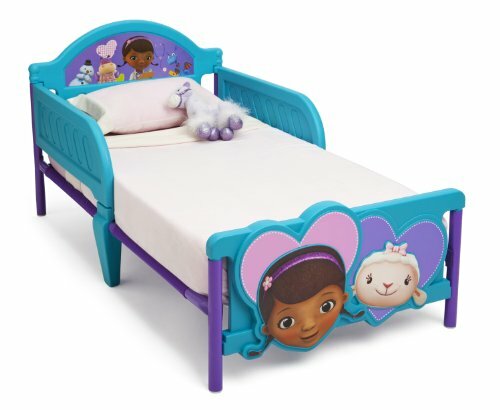 Officially licensed Doc McStuffins bedding is here! This 4 piece bedding set comes with a beautiful purple/pink comforter, a fitted sheet, flat sheet and pillowcase. 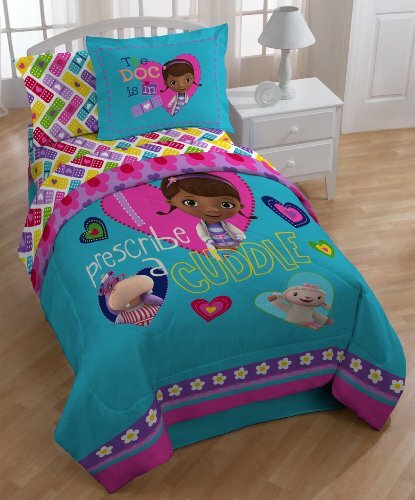 There is also a pretty Doc McStuffins personalized pillowcaseon the market. This standard pillowcase features a picture of Doc and all of her friends. Your daughter's name can be added to this cute pillow. You can also decorate your daughter's bedroom with handmade wall decorations. 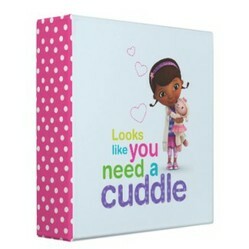 The first are Doc McStuffins wall plaques. These handmade wall decor items are sold in sets of 5 plaque include Dottie, Stuffy, Lambie, Chillie and Hallie. Each plaque measures 4" x 4" and come with a ribbon for easy hanging. They are crafted using a decoupage technique. 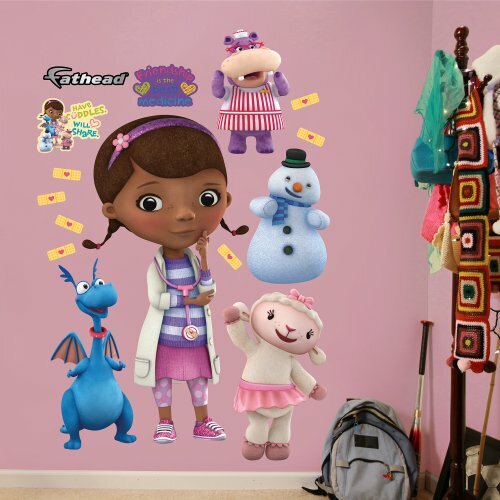 Other room decor items include Doc McStuffins and Friends wall stickers. Each order comes with 8 one of a kind wall stickers. The stickers can be removed and repositioned with no damage to the wall. They will look so cute in your little girls bedroom! 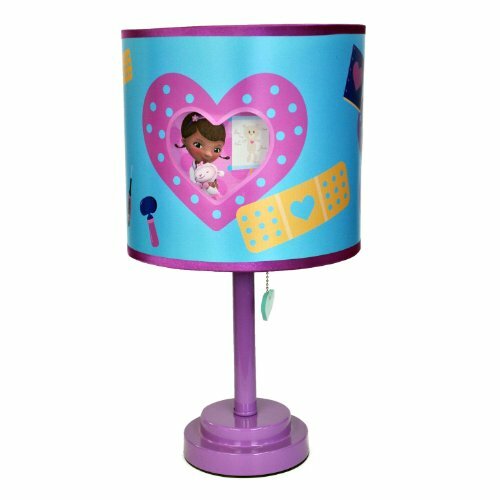 Finish off your daughter's room with a unique Doc McStuffins light switch cover. Your little girl will dazzle and sparkle in these gorgeous, handmade jewelry and hair accessories. These unique items are sure to make your daughter the envy of all of her friends! The Doc McStuffins boutique items available include flower hair clips, beaded bracelets, boutique bottle cap necklaces and sweet hair bows. The beaded stretch bracelet features a bottle cap with an image of Dottie. This bracelet can also be personalized with your daughter' name. The boutique necklaces also have a bottle cap design and hang on a pink ribbon cord. The Doc McStuffins hair accessories come in a fun daisy flower design as well as a bottle cap bow made with licensed grosgrain ribbon. In addition to the custom gifts featured on this page, there is also a large assortment of officially licensed toys and games on the market. 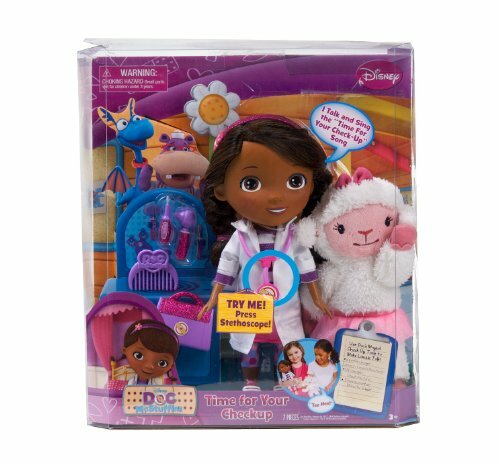 If your child wants to play "Doc" like on the television show, there are many Doc McStuffins inspired medical kits to choose from. Other Doc McStuffins toys and merchandise includes plush toys, talking plush, Interactive toys, books, DVD's, puzzles, play telephones, toy figures plus a Big Book of Boo Boos like the book Dottie uses on the show. A very hard to find toy! I agree, the merchandise is adorable. Too bad my girls are too old for this show. These Doc McStuffins are so cute! :) I took a look at the Disney page on Zazzle. So much wonderful stuff for kids! !